TITANIUM DROID TRI-FIGHTER MINIATURE REPLICA. INCLUDES DISPLAY STAND! READ BEFORE PURCHASING! The Box is in great condition one ding on the window see pics. 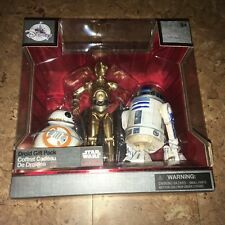 Droid Tri-Fighter Titanium Collection STAR WARS item New and Sealed in the box or on card. Perfect for any Collector or Fan. - Item is SOLD as is. Star Wars - Episode 1. Made by Hasbro in 1998. R4-G9 Droid Elite Series DIE CAST Figure STAR WARS Disney Store Astromech NIB. Condition is New. Shipped with USPS Priority Mail. This set was released last April during Star Wars Celebration Orlando and inventory is running low. Don't miss out! Star Wars The Clone Wars. Inspired by the Star Wars: A New Hope. Fully poseable with seven points of articulation. TITANIUM SERIES. DIE CAST VEHICLE. UNOPENED ORIGINAL FACTORY SEALED. Hailfire Droid Titanium Series STAR WARS item New in the Box or on Card. This its a Scanner Driod. See photos for all issues. EG-6 POWER DROID. 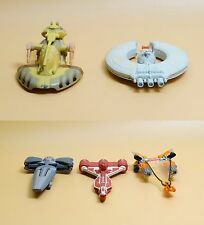 MICRO MACHINES . collectible condition ! Manufactured by Hasbro in 2006, the Federation Droid Fighter features rotating wings, display case and display stand. Federation Droid Fighter. 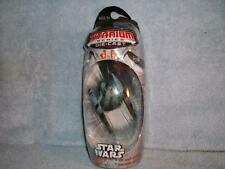 Star Wars Titanium Series Ultra. 2005 STAR WARS. TITANIUM SERIES DIE CAST. FEDERATION DROID FIGHTER. FEDERATION DROID FIGHTER . STAR WARS TITANIUM DIE CAST series. Made by HASBRO 2005. 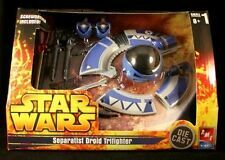 Droid Tri-Fighter Ultra Series 7" Large Scale Star Wars Titanium Series Collectible item in Great Shape in the original case. This is aHellfire Droid Anti-Armor & Anti-Aircraft Assault Droid. One of the most terrifying sights for Republic forces in the opening battles of theClone Wars was that of a large group of Hailfire droids racing at insane speeds through the acrid smoke blown out of the exhaust ports of the missiles they carried. Item is used and may have minor paint scuff or other minor wear, and is being sold as is. -see photos for exact condition. Federation Droid Fighter. These remorseless fighter droids are designed to strike with quickness and precision. During the Battle of Coruscant, the Separatists deploy hundreds of these agile droids to fight against the fleet of the Republic. 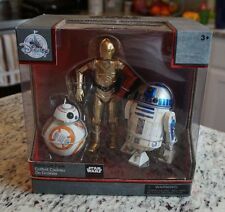 Disney Star Wars Droid Gift Set Elite Series Die Cast Action Figure Set New! Includes three standing bases. C-3PO: 6 1/2" H.
This is a really cool Star Wars die-cast. The die-cast model is a Trade Federation Droid Fighter. It is in a great condition. It was never removed from the base and was never played with. The first time that it was out of the case was for the pictures that I took for this listing. The case is in a really great condition as well. It is from the Star Wars Titanium series. It is a little bit larger than the mini die-cast models. If you have any questions feel free to send me a message. Please look at all of the pictures attached to the listing. THE BIN PRICE TAKES THE CONDITION OF EACH ITEM FROM THE LOT INTO CONSIDERATION. This item is unused & new in the box. THE BEST THING TO DO IS TO LOOK AT ALL PICTURES PROVIDED. NO EXTRA FEES FOR YOUR ITEM. 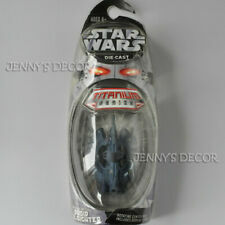 Star Wars Trade Federation Droid Fighter Titanium Die Cast Series 2005. Condition is good, unused. Package has some shelf wear. Label across front of package is loosened. Never opened. C-3PO (Episode 8 Force Awakens Version). The set comprises. Federation Droid Fighter / Droid Tri-Fighter. Made in 2005 by Hasbro. See photos for more details. Never opened. The box its in great condition. I am working on moving ALL of my Star Wars collection. Condition: MISP. The ability to destroy a planet. This toy is SOLD AS IS. (Poor - Fair - Good - Great - Excellent). See table for definitions of acronyms. See "Condition Details.". MAJOR flaws are noted! We go the extra mile for your collectibles! Bottom of blister has small ripple from factory. Does not affect condition. Corners slightly bent.